Garlic | Become Healthy or Extinct! Garlic comes from the Allium family and is related to the onion, shallot, leek, and chive. With its unique combination of flavonoids and sulphur-containing nutrients there is reason to believe garlic adds more than aroma, and taste to food. Recent research has uncovered additional sulphur containing compounds that support good health. Garlic is also a great source of manganese, vitamin B6, vitamin C and selenium. Garlic has a very long folk history of use in a wide range of ailments, particularly ailments such as ringworm, roundworm, parasites, typhoid, food poisoning, candida and vaginitis where its fungicidal, antiseptic, tonic and parasiticidal properties have proved beneficial. The plant produces inhibitory effects on gram-negative germs of the typhoid-paratyphoid-enteritis group. It possesses outstanding germicidal properties and can keep amoebic dysentery at bay. The component of garlic, allicin, which causes the familiar strong smell and flavor, is actually an extremely effective antioxidant. As allicin digests in the body it produces sulfenic acid, a compound that reacts faster with dangerous free radicals than any other known compound. Garlic enhances the body’s immune system while slowing the growth of bacteria and viruses. Its anti-bacterial action kills bacteria that cause cough, colds and other throat infections. It is very effective in curing bacterial infections of the skin as well. It has even been found effective in killing antibiotic-resistant bacteria like MRSA. Its ability to remove pathogenic bacteria without depleting the body’s natural flora makes it a preferred herbal antibiotic. As it cleans the intestinal flora it may increase wind for a few days. Garlic is a potent anti-fungal. It destroys yeast infections and is therefore a preferred Candida killer in alternative medicine. Garlic exhibits anti-viral properties as well. Garlic also seems to have anti-cancer activity, since studies suggest that people who consume more raw and cooked garlic are less likely to develop breast, stomach, colon, ovarian, prostate, rectal and oesophageal cancer. Garlic exhibits anti-clotting properties and therefore has the ability to prevent blood vessels from becoming blocked. It prevents platelets from becoming too sticky and lowers plaque build-up in the arteries. Research has shown that allicin from allin in garlic blocks angiotensin 11, which makes blood vessels contract. This facilitates the dilation of blood vessels thereby maintaining healthy blood circulation and lowering blood pressure. Regular consumption of garlic not only lowers LDL Cholesterol, but also promotes good heart rate, thereby reducing the risk of a heart attack or stroke. Garlic slows the development of arteriosclerosis and lowers the risk of further heart attacks in myocardial infarct patients. Garlic has a potent therapeutic effect on the lungs. The volatile oils actually appear on the breath having cleaned the bronchioles and alveoli. It is strongly decongestant. It encourages the free flow of breath. As an expectorant it can help to clear wet and sticky mucus. It is a very useful remedy for the flu, colds, catarrh, heavy feeling, sluggishness, loss of appetite, shivering, aching limbs and myalgia. Garlic induces the release of insulin in diabetics, thus helping regulation of blood sugar. Garlic can also remove mercury and other metals from the body. Toothaches can also be cured with garlic, as the analgesic, anaesthetizing and antibacterial property of garlic provides instant relief to aching teeth. Externally, the expressed juice is an excellent antiseptic for treating wounds. Research also indicates garlic may be useful for controlling weight. 2 to 4 cloves per day is a safe quantity to have. Garlic cloves must be crushed or chopped in order to stimulate the process that converts allin into the beneficial allicin. Once the garlic is cut, the active compound loses potency rapidly and can disappear completely within about an hour of chopping. The best way to eat garlic is to take a whole, fresh clove, chop it, smash it or press it, wait a few minutes for the conversion to occur, and then eat it. It is a prescribed as an ingredient in some raw juices. If you use jarred, powdered, or dried garlic, you won’t get all the benefits fresh garlic has to offer. It is important to note that a number of people are allergic to garlic. If you are one of them, you should avoid it. The bulb of garlic is pungent in taste and it produces internal heat. This is why it clears both mucus and gaseous distension. It is passion inducing and therefore an inappropriate food for those practicing a sattvic or yogic lifestyle. Avoid too much heating activity (exercise, sunbathing, anger) while taking garlic to reduce the chance of any aggravation due to internal body heat. It is also better avoided during pregnancy for the same reason. Caution is also advised if you are taking antiplatelet medication as it may potentiate anti-coagulation effects of these medicines. 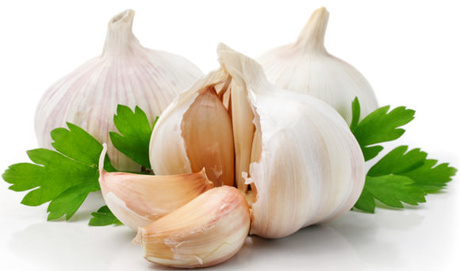 Avoid garlic if you are taking hypotensive medication as garlic reduces diastolic blood pressure. It is also best to avoid garlic for 10 days prior to operative surgery.